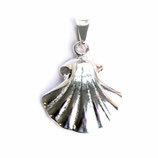 This unique scallop is made of sterling silver. Its special shape makes it a striking and fancy accessory. 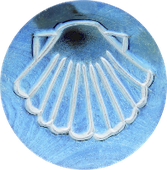 The pendant is handmade, which makes every single one unique. Slight differences in form and color are desired and are a sign of quality! The photo shows the pendant with a rope chain made from 925er sterling silver. Available in our shop!